I had been thoroughly enjoying my free wine every evening, and occasionally during the day, on my Viking River Cruise along the European Rhine. 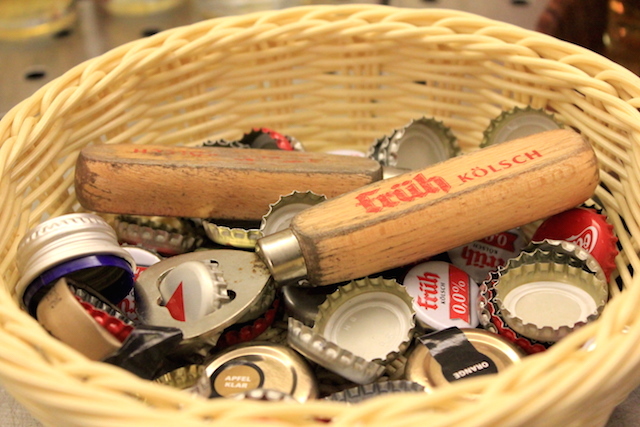 But, when the Tor ship hit Germany and ported in Cologne (Köln), it was time to put a cork in the wine bottle and venture inland for a Kölsch beer. Kolsch (pronounced “kelsch”) is a protected beer that must be brewed by a member of the Köln Brewers Association, and is typically produced within a 50 km radius of Cologne. It is a refreshing, golden colored beer, that is often enjoyed during the warm weather months. Actually, in this area dark beer is considered to be the ‘bad beer”. Forget about a pint of Guinness here. While at port in Cologne, a couple dozen cruisers chose to participate in an optional late night “Pub Crawl” excursion. 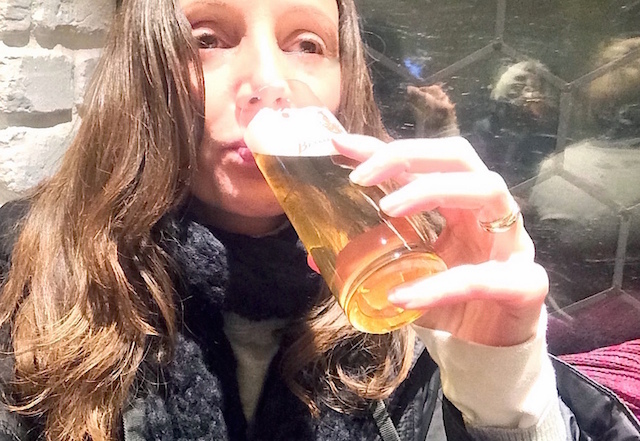 Most attendees were diehard beer fans, and then there was me, a wine girl from the Napa Valley area of California. This should be interesting. 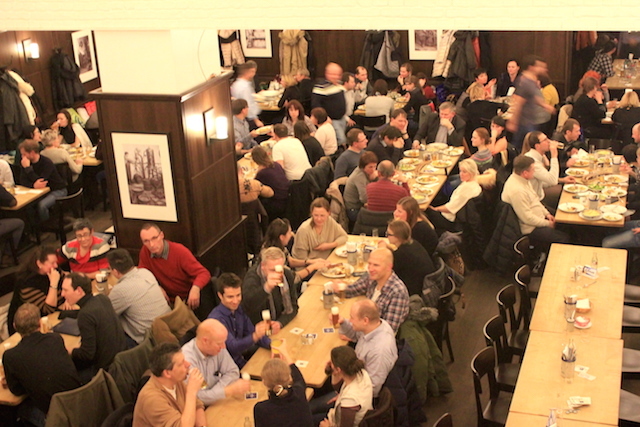 Each of the 100+ brew houses in the city feature only one brand of the 24 in total that signed the Kölsch Convention, a document stating the criteria needed in order to be called Kölsch. Tonight we would be visiting four of the brauhauser. Luckily, I had a designated drinker. The male counterpart of a newly married couple, graciously offered to drink any portion of Kölsch that I was not able to. Which was bound to be a lot. 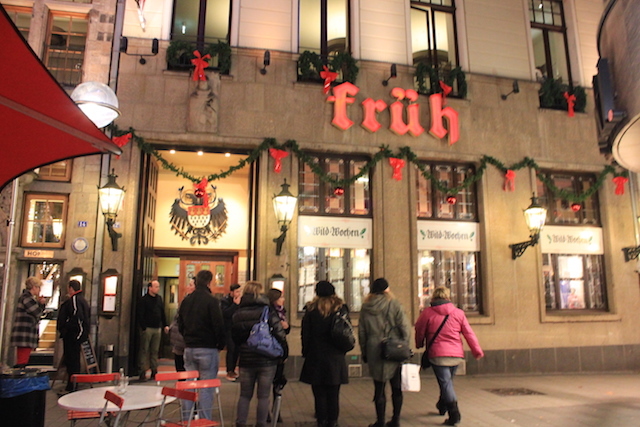 We began our crawl at one of the biggest and most popular brew houses in town, Fruh. Immediately upon entering, numerous glasses were lined up. Waiting for us. Let the drinking begin. We ordered our first round of Kölsch. 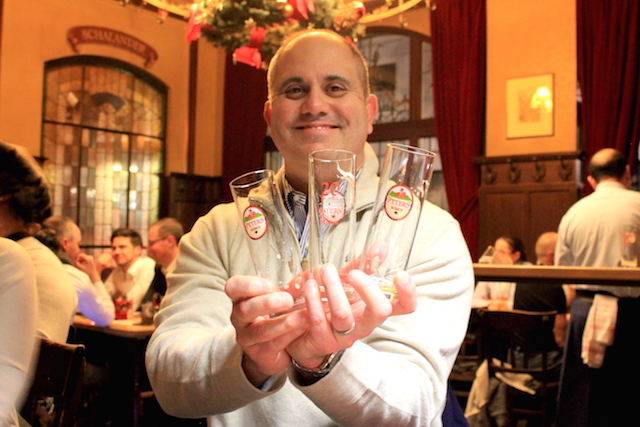 Each beer was served in a small glass, not the popular pint size back in the States, but a fifth of a liter, about 7 to 8 ounces. This way the beer is always fresh, unless you are me and it takes an hour and a half to drink seven ounces of beer. As customary in a Brauhaus of this style, we also ordered one Kölsch beer for the waiter who was dressed in the traditional blue outfit. It was a liquid tip. Sometimes he does not drink it, but he will get the money for it. You don’t have to flag down the server to order your next beer, it is just given to you automatically, much like my red wine at the Viking dinner table. Though, any subsequent glasses of beer on this pub crawl would be immediately passed to Erik, my DD, he could handle his liquor way better than myself. Prior to drinking a newly poured Kölsch we were taught to clink our glasses at the bottom, not the top, or it will equal seven years bad luck. I may have accidentally given some people bad luck by consistently forgetting this part of toasting. All done? Just put a coaster on top of your glass to say I have had enough. 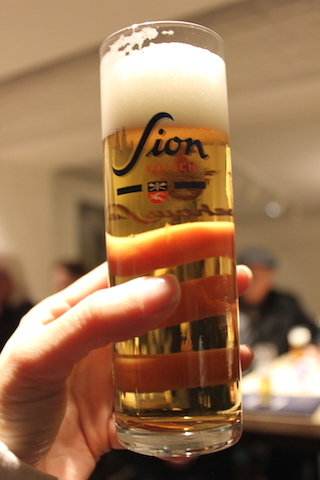 The next brewhouse was Sion Kolsch. I took two sips, one to taste a sampling and one for the photo op, then handed it over to my designated drinker waiting patiently in the wings. 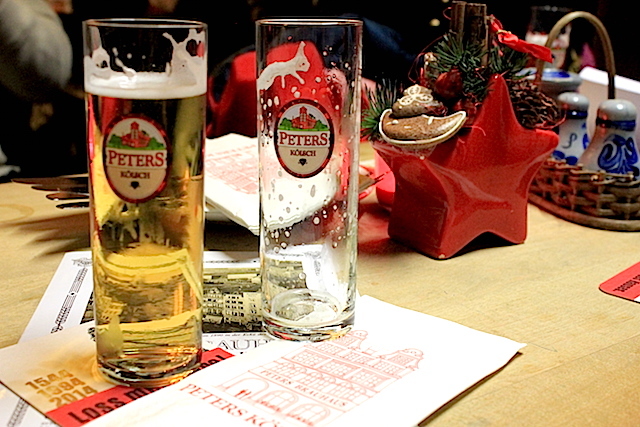 Then there was Peter’s Brahaus, our tour guides favorite drinking spot, followed by Gilden, where there was absolutely no room inside and we had to enjoy our beers on the patio in 45 degree weather. We weren’t alone. In the end my favorite Kölsch was at Fruh and Erik walked away having drank 2.4 liters of beer. He was a happy guy…and I was sober. Win, win. Disclosure: I was a guest of Viking River Cruises, but all the words I write come straight from my, sometimes distorted, mind. Just as it should be. Kölsch is one of my favorite beers! I first had it when I was living in Germany and was instantly in love! I bet living in Germany you had access to all sorts of great beer! 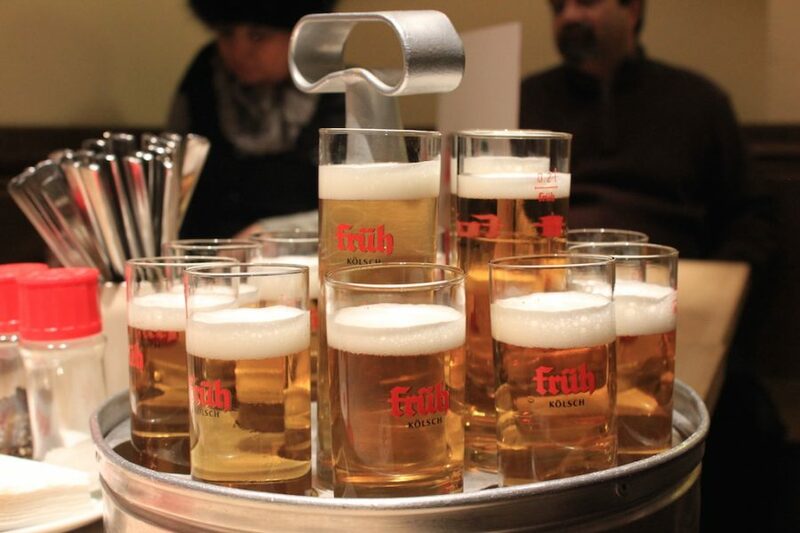 Good to hear that Kölsch ranks high!